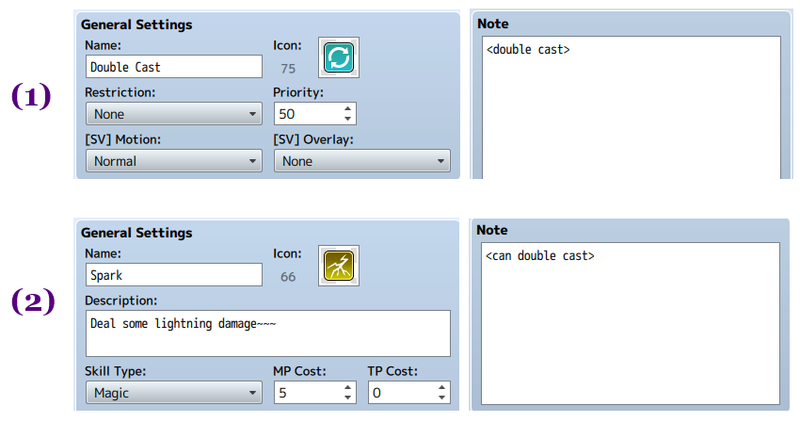 This plugin allows you to easily double the number of times certain skills are casted. When a particular state is added to an actor or enemy, all of their skills will hit twice as many times. For example, by default, when you cast heal, you only heal once. However, when the double cast state is effect, you will heal twice for the price of one! Download the plugin and place it in the “plugins” folder in your project’s “js” folder. Then open your Plugin Manager (F10), double-click an empty row, and select the DoubleCastState plugin. Which will specify that they have the double cast effect. Only skills or items that have this note-tag will have the double effect. I have a idea / request if you ever get the time. If you’re familiar with Final Fantasy 1 or Wizardry, both allowed progressively more hits as an actor leveled up / gained Agility. By the default engine AGI feels woefully under powered. Just an idea for something that would likely be fun! 🙂 Thanks again for this script! Hmm, so basically tying number of hits to a particular parameter? Would this only affect the “attack” skill? Or other skills as well, potentially? In the examples I gave it only affected the default attack skill, but depending on the complexity it may be interesting to make it work on some skills via notetag. Sorry for delay, been away for holidays.